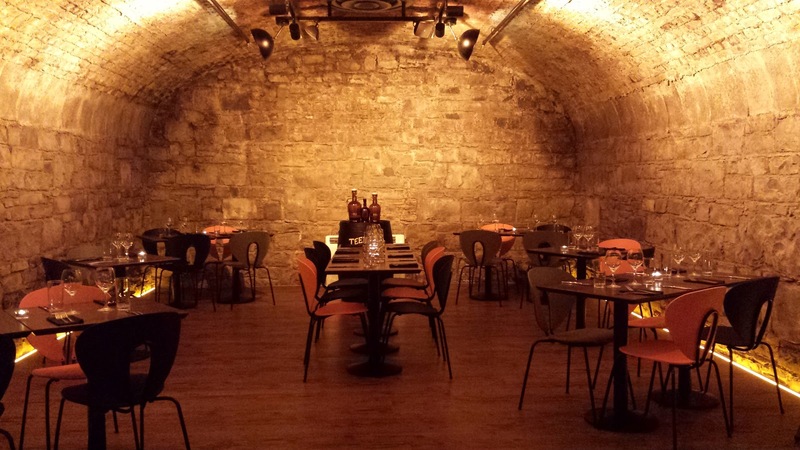 Dublin's city centre finally has a new brewpub and it's a beauty. 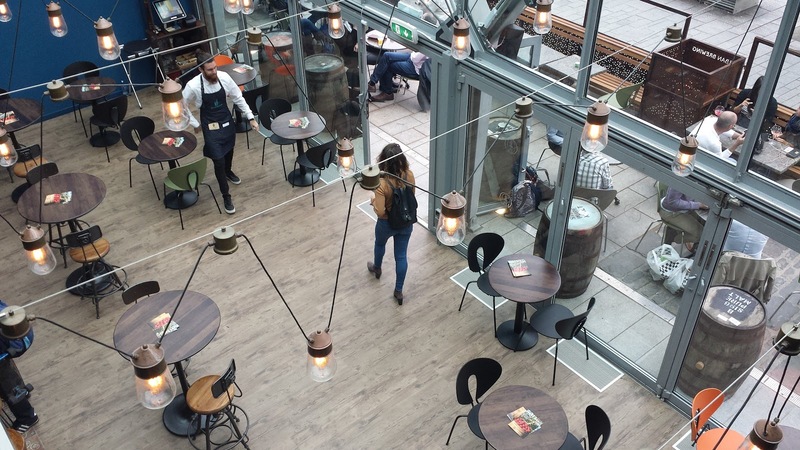 Urban Brewing is based in the CHQ building next to the beautiful Ely Winebar. It's a similar idea with a glass fronted bar at ground level with outdoor seating and then downstairs, a warren of exposed brick cellar rooms. 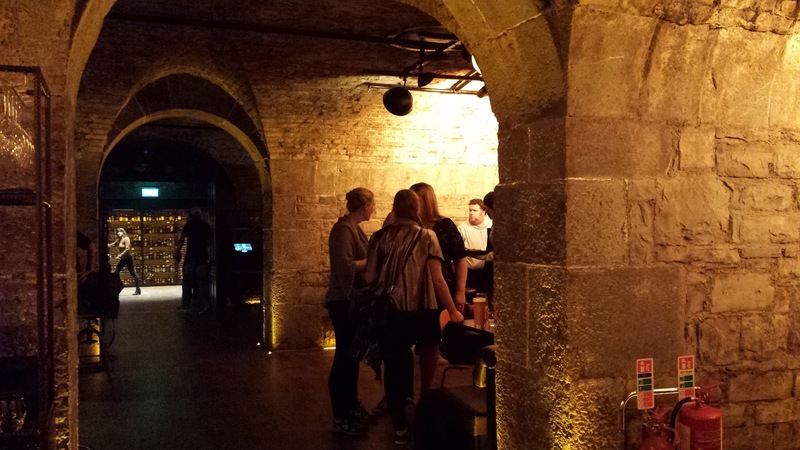 The launch kicked off upstairs where we were able to try the beers. There were two Urban Brewing beers available, an Elderflower Saison and a Raspberry Wheat. They have potential but are a little too young at the moment. They will be better in a few weeks. 51st state was on tap so I tried that. It was certainly fresh with a lovely aroma of citrus hops with a little tropical fruit. It's a fair bit more bitter than their regular pale ale too. I really enjoyed it but it's worth noting that this is not a NEIPA. Some people are confused but it's only inspired by the NEIPA style, perhaps the inspiration is just to put the phrase on the label but thankfully it's not a NEIPA. It's just a good, solid IPA. 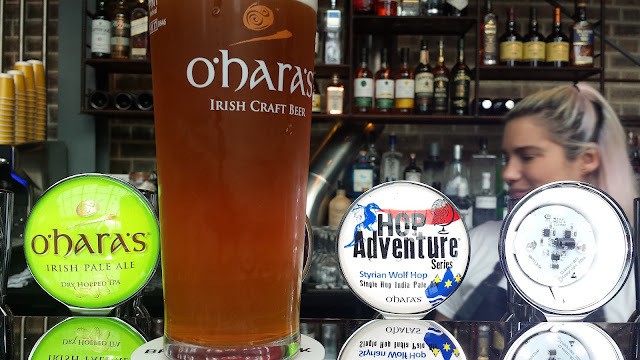 I also tried the latest Hop Adventure, this one with Styrian Wolf. 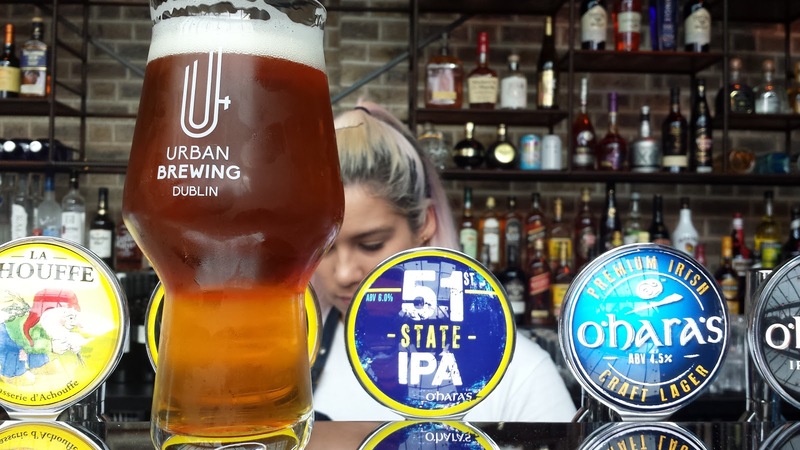 It's a little on the dull side after 51st State but it's a decent pale ale. The Styrian Wolf imparts a big grassy hit but not much beyond a little citrus. As well as brands owned by Carlow Brewing Company, they also have guest taps such as Trouble Brewing Remix which was there on the night. If you don't look up, you might miss the fact that the brewery is on a mezzanine level above the bar. It's a 1000 litre kit and the beer is pumped downstairs to ferment in the cellar. Once it's ready, it gets pumped back upstairs and into the serving tanks. 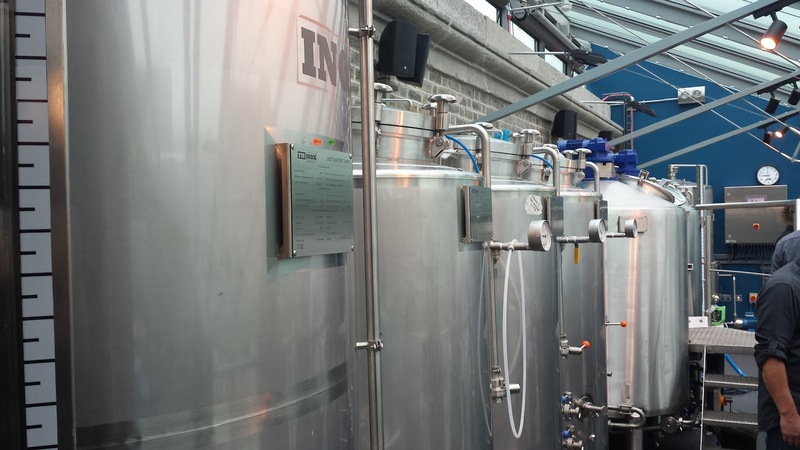 No kegs or bottles, the beer is served fresh from the tanks. 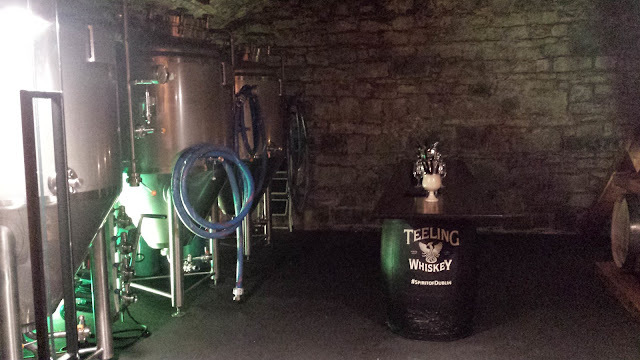 The fermenters are down in the cellar. You can stand around the table and eat tapas or drink beer if you like. Just like Ely next door, the cellars are vast and cavernous. All of the exposed brickwork is still there of course. Apart from being part of the atmosphere, I'm fairly certain they wouldn't be allowed to change anything due to the historical nature of the building. There's a smaller bar downstairs too with about half the number of taps as upstairs. Downstairs is very much a restaurant feel with tapas currently being the ony thing available as far as I can tell. Remember, they haven't fully opened yet and the chef is experimenting. I'm not convinced that tapas style bites will work in a beer orientated environment but then again, they serve wine too. The question is, will wine drinkers decide to come here rather than Ely next door? Tapas can indeed go very well will beer of course but if you're doing small bites, you need to have a range of food that complements beer but also satisfies the beer drinking consumer. That means you need a bit more of a range of meats available and while I know it's cliché, a bit of pulled pork wouldn't go amiss. It will be interesting to experience the final menu when they open up fully though. Either way, it's a fantastic addition to the city centre and I suspect it will bring more people to the CHQ building. There's so much potential there that has never been fully utilised but it's getting better and Urban Grill will go along way towards giving the whole building a much needed boost.